Breathe life back into your hair with L'Oreal Professionnel's Pro Fiber Revive Shampoo. Ideal for fine, normal and slightly damaged hair, the reviving formula utilises professional resurfacing technology to prolong the effect of the Pro Fiber in-salon treatment, and delivers long-lasting benefits to cleanse, revive and revitalise your locks. Hair feels beautifully cleansed, soft and lightweight from root to tip. - K.N. On wet hair, lather to form a rich foam. Follow with Pro Fiber Revive conditioner or masque and leave-in. Apply Pro Fiber Revive every 4th wash to extend the lasting effects of the treatment. 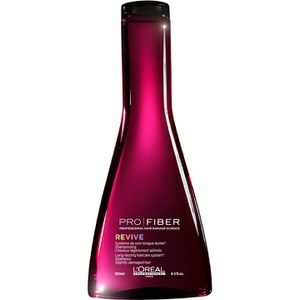 Pro Fiber Revive at-home routine (Shampoo, Conditioner, Masque, Leave-In and Revive) follows exclusive in-Salon treatment to prolong the effects of the APTYL 100 on the hair fiber. * Instrumental tests after the salon routine – up to 4 Pro Fiber shampoos (Revive/Restore/Recover).